This sit-stand desk mount system provides an ergonomic solution allowing the user to change the way they work throughout the day. 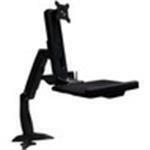 the spring arm provides the user the ability to move the workstation from side to side and up and down. the workstation module provides a keyboard tray with a built in mouse pad which can be slid into place on either side of the keyboard providing for mouse operation on the left or right side. there are 2 built in holders, one for a scanner and the other for the mouse allowing for organization of the workspace. the flat panel display mount can be individually rotated, raised and lowered without changing the keyboard position. this allows for a wider range of motion to accommodate different work requirements.